What is Glaucoma? – It is a condition that affects the optic fibres of the eyes. The optic fibres are the ones that send information to the brain from the eyes. In the healthy eyes of all people a fluid by the name of aqueous humor develops. The pressure in the eyes get build up when the excess aqueous humour does not drain from the eyes. This results in ocular hypertension. If left untreated it results in peripheral loss of vision and to blindness over a period of time. Early medications can treat the problem of glaucoma. It is the primary reason for the blindness of people over sixty years of age. Glaucoma usually does not exhibit any symptoms. It is the most prominent form of glaucoma affecting people. It results when the meshwork of the eye does not drain the excess aqueous humor from the drainage duct of the eye. This increases the eye pressure which changes from hour to hour. No two people have the same pressure level. The pressure level for one person will be not effective or correct for another. The eye goes blind when all the nerve fibres die. The symptoms of this glaucoma is very difficult to interpret because it manifests only after it has fully developed. So there are chances for the doctor to skip the presence of glaucoma in the eye of a patient. The eye pressure can be effectively measured in the mmHg measurements. The normal eye pressure of an individual is about par or below 21mmHg of mercury. Although this is the appropriate eye pressure, some people experience high pressure and damage of the nerve fibers. They are treated with the similar methods of the patients of open angle glaucoma. This is also one of the most type of glaucoma. It is the most serious type where the iris blocks the drainage of the aqueous humor. This increases the eye pressure and the doctor should be met immediately, otherwise it will result in blindness. The symptoms include severe headache, vomit, nausea, blurred vision and eye pain. Besides halo will also be visible around the lights. This produces no to little symptoms. This is a very rare form of glaucoma where it affects the infants and children at a very young age. The children will not be aware of the things happening to them and so may keep silent even if they have a symptom of this glaucoma. The parents must check for any protruding hazy structures from the eye of the children. The secondary glaucoma as the name indicates is the condition of any other previous eye problem or tumours. It results from any eye injury and other intake of drugs and steroids. Any enlargement in the lens due to surgery of cataract also results in glaucoma. In this type of glaucoma, the pigments from the iris causes a blockage in the drainage of the aqueous humor. It is a very form of glaucoma that affects only white males. The blockage hinders the flow of the aqueous humor and increases the pressure in the eyes. The glaucoma has no pain or any other symptoms of it. The visible symptoms occur after the nerves fibres have been damaged irreversibly. The glaucoma causes permanent vision impairment. 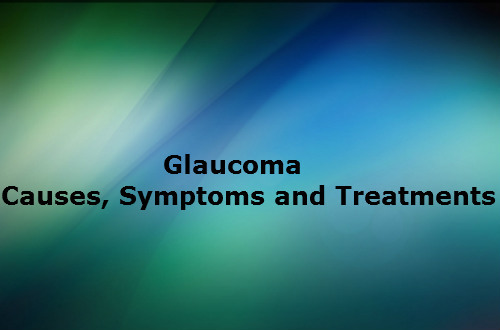 Except narrow angle glaucoma which shows symptoms of nausea, headache, vomit and halos around lights, none of the other types of glaucoma exhibit any clear symptoms. If anyone is lucky enough to know about any symptoms in advance, they must rush to an eye hospital to check their eyes. The exact reason for the formation of glaucoma is not known. It has been speculated that due to the rise of blood pressure in the eye causes glaucoma but even people with normal eye pressure also develop the problem of glaucoma. Tedious to focus distant or near objects. Unable to look at lights directly. Excess of water oozing from the eyes. Loss of vision in eyes. Formation of halos around lights. Ghost like images obstructing the normal visions. Difficulty in straying in dark rooms. Early detection of glaucoma is beneficial. At first the eye is numbed with drops. The doctor first examines the drainage area, optic nerve fibers, eye pressure and the visionary field of the eye. Based on the reports of these tests the doctor will perform analysis and take a decision about further treatment of the patient. The damage caused by glaucoma to the nerve fibers is irreversible. Visual Field Testing is one of the tests performed to diagnose glaucoma. It involves looking straight into the machine and pressing a button if we see any light or spot in it. It is done many times and the doctor effectively will find the level to which the eye is being affected and will sort a way the problem can be minimized. Gonioscopy is performed to test the drainage area of the eye to see the level of its affection of glaucoma. The bimicroscopes are fitted with some lenses to clearly check the drainage of the eye. Ay tumour or injury to the eye. The treatment relies heavily on the condition of the eye. Generally glaucoma cannot be cured but can be controlled to some extent. Medicines, pills, tablets and even surgeries are being performed to slow down the extent of the glaucoma. Since the glaucoma can be undetected, it is advisable to check your eye frequently. Treatments aim to reduce the eye pressure. Since the glaucoma is associated with no pain, people do not often use the eye drops that control the eye pressure. In case the drops used for the treatments of glaucoma are providing with an irritating or itchy sensation, the person must go to the doctor immediately. Laser Surgeries are the most effective cures for glaucoma treatment. The Trabeculoplasty is a surgery which elevates the drainage of the eye that helps in the easy drainage of the aqueous humor. Iridotomy is a type of surgery performed to make holes in the iris to assist in the drainage of the fluid. Operative Surgeries are needed if the doctor wishes to create another channel for the passage of the fluid. It helps to reduce the eye pressure. The Intraocular pressure is calculated using OPP. It is the abbreviation of Ocular Perfusion Pressure. It is the measurement of the intraocular pressure and the person’s own blood pressure. High Blood pressure and inactive lifestyle also causes the glaucoma so that the change in these would secure a chance of not being affected by glaucoma. Abstaining from smoking, eating healthy diets and good lifestyle are the ways to effectively lead a happy life free from glaucoma.